The student handbook (rules) and student planner (calendar) are two different documents this 2014-2015 school year. The student handbook is provided electronically from the CVMS webpage. Those households that wish a printed copy of the handbook-rules will be provided one. A letter going home on the first day of school will highlight the printed copy requests. Students are strongly encouraged to read and adhere to the school rules outlined in the student handbook. This 2013-2014 student handbook link is provided as a reference document as well as a method of duplication in the event you wish a printed copy. Students are expected to read and adhere to the rules outlined in the handbook. A specific grade level guidance period will occur during the first week of school. In that guidance period students will receive information related to the rules and successful school strategies. Each student will be provided a planner to assist with the student's long and short range educational time management and planning. There are generally two types of bell schedules per week at CVMS, regular and block. 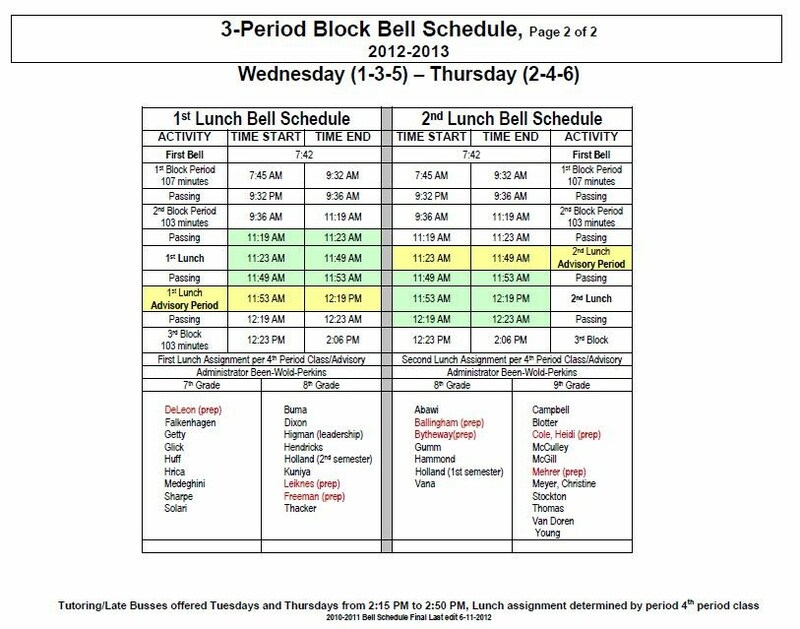 The regular bell schedule allow for six class periods per day and is generally affixed to Monday, Tuesday, and Fridays. The block schedule allows for three longer class periods per day. Wednesdays generally sequence the periods 1,3,5; Thursdays generally sequence periods 2,4,6. 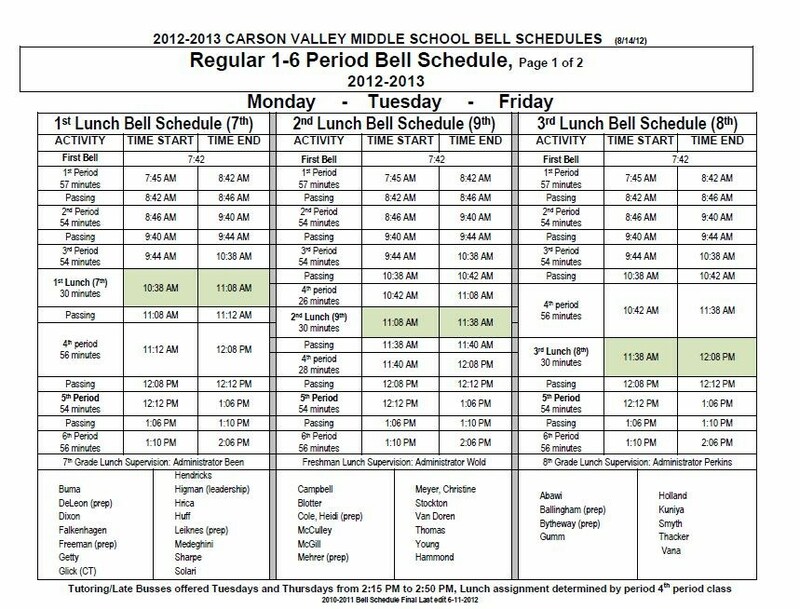 Click on the bell schedule icon to view a full size copy of the CVMS bell schedules. CVMS will occasionally find it necessary to modify the class sequence and or class period length for special events that include but not limited to assemblies, standardized testing, or "early outs." Special schedules will be advertised in newsletters, daily anouncements, and on the CVMS master calendar. The teaching staff at CVMS has reserved Tuesday, and Thursday afternoons, 2:15pm-2:50pm, for tutoring activities. This is a generality as occasional staff meetings or clubs will interfere with some staff members tutoring time. Please confirm with the teacher about tutoring opportunities.